I haven't spoken about what kind of vegetables would I be able to plant in my garden this year. Since the yard isn't quite and no way near to its normal look still. I don't even know where to start, it is just way too much, however, I am hoping to at least settle and clean up the other side of our yard and maintain it's landscaping until we finally come up with a final plan for what would our yard be look like in the future. Anyways, for those who wish to plant cucumber and yet have no success last year, I would like to share some tips with you which I found at houzz.com website. It's quite easy and quick and soon after you follow this, then you'll cucumber will be covered in your salads for the rest of this summer. I hope you'll find this interesting and would help you out. Mommy N, that really is cute. It will help the cucumber grow healthy. I never was good at gardening, it would be awesome to learn more about it and acquire some skills. Thanks for sharing! Wow, that is a great idea. 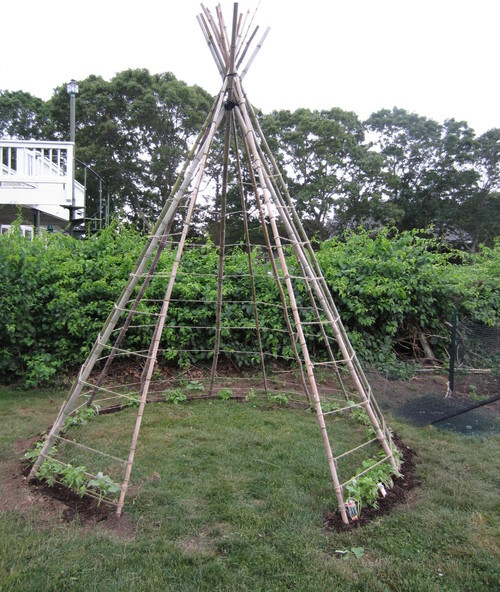 It is like a tipi style!